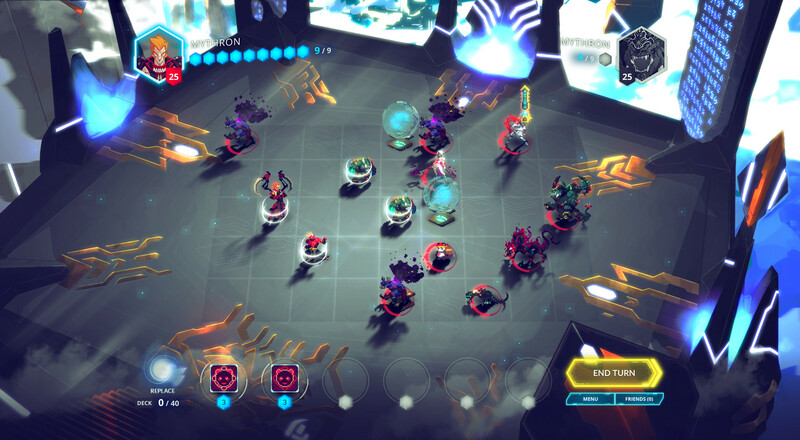 Duelyst is a digital turn-based strategic collectible card game (CCG) that was originally funded on Kickstarter. Duelyst is made by a team of veteran developers who have worked on games such as Diablo III and Rogue Legacy and is available as a downloadable client for Windows and Mac or as a Web based application designed to be played in the Chrome web browser. 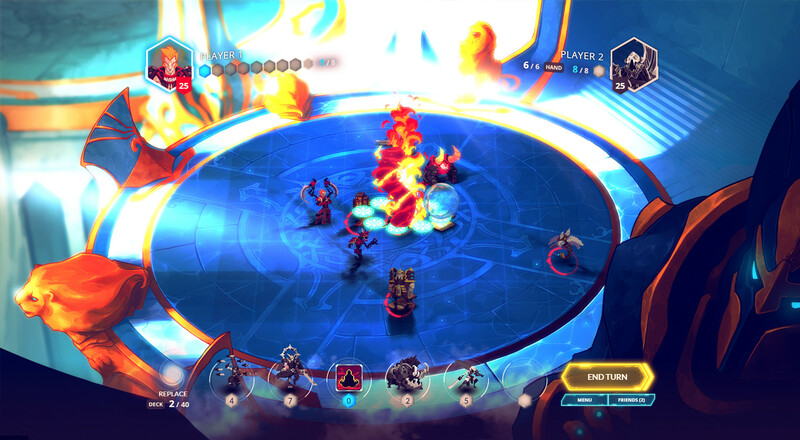 Duelyst employs a free to play model similar to Hearthstone and many other digital CCGs. The game can be downloaded and played for free. Additional cards are the purchased in packs with in game currency that can be gained by winning matches or buying it with real money from the in game store. Some of the in game currency is also gained from completing single player training missions and special single player challenges with unique win conditions. As a general rule, as in most free to play digital ccgs a free player can expect to "grind" about 1 free pack a day. Card packs in the game are called "orbs" and include 5 cards divided into four levels of rarity that can be from any of the game's factions. The rarity drop rates per card pack are as follows: 60% common, 25% rare, 10% epic and 5% legendary. Duelyst is a modern collectible card game (CCG) designed for digital platforms. Players take turns playing cards from their pre-built or customized decks (called "squads" in Duelyst) made of of 40 cards from a pool of over 300. A deck in Duelyst is made up of cards from one of six factions each with its own unique battle units, spells, artifacts and play style. Additional battle unit cards can also be added to any faction's deck from a special set of neutral faction cards. The neutral faction does not contain any spell or artifact cards, as these are unique to each faction. Each player begins by playing their "general", a battle unit card unique to each faction that represents the leader of the players squad. Players then take turns drawing a cards and playing them out on to the play field. Each turn a player may discard a card back into their deck and draw another one. When a battle unit card is played, an animated figure representing the unit summoned is placed on the battle field. Spell cards can be played to trigger direct effects to units on the field, such as buffs for the player's units or negative effects for the opponent's. The third type of card are artifacts of which up to 3 can be equipped to a player's general granting it special abilities. A game is won by the player who first drains the health pool of the opposing player's general. The 5x9 grid battlefield on which units are played adds strategic positioning and movement elements to the traditional card-battler format. Mana is gained at one point or "crystal" per turn and is used to pay the associated casting cost listed on the cards. Mana springs are located on the battlefield and grant an additional mana crystal for one turn to the player that reaches them first. Most battle units cannot attack the on the turn that they are summoned, and have a movement capability of two tiles per turn. Duelyst features both casual and ranked ladder play with seasons and an emerging competitive scene. The game has multiple play modes including a draft mode called "gauntlet", supports real time in-game chat, features public chat channels and has relatively quick queue times. 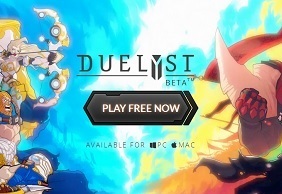 Duelyst looks to be one of the more developed and well thought out of the new crop of free to play online digital mmo ccg's and is worth looking into for fans of those types of games. Note that when signing up for a new account if you use the referral code "redditpals", you'll start the game with an extra 100 gold. This is a special promotion available thanks to the game's reddit community which you can find a link to below.